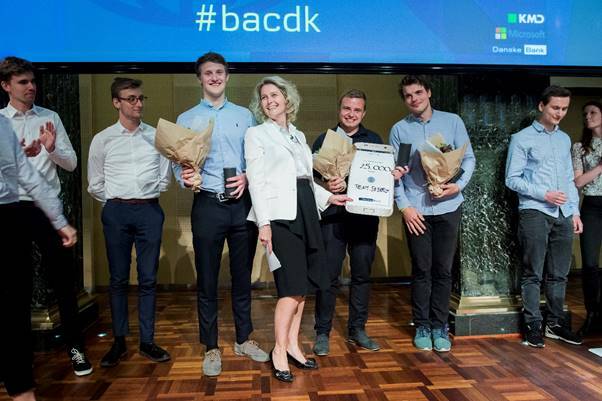 Earlier this year, Danske Bank, KMD and Microsoft put forward the Business Analytics Challenge 2017 (https://danskebank.dk/bac2017), in which university students from across the country were challenged to work with advanced analytics tools and real-life big data to find innovative solutions to relevant business problems in the area of banking. More specifically, Danske Bank and its partners asked students to develop solutions that are able to predict the future of a company (e.g., Will the company excel or default?). Oliver Müller, Associate Professor in the Business IT department, has incorporated the challenge into his Big Data Processes course, so that students had the opportunity to apply their newly learned knowledge in skills to real cases. Team Søberg, consisting of Per Rådberg Nagbøl, Benjamin Søtang Steenberg Olsen and Niels Helsø, were invited to pitch their solution in the finals. Their prototype applied natural language processing techniques with machine learning methods to automatically sift through hundreds of thousands of textual auditor’s statements and extract potentially useful knowledge for predicting a company’s future economic development. The team found out that the content of the audits can indeed be used as predictors and that it adds valuable extra information to financial metrics normally used in bankruptcy prediction. The three team members of Team Søberg, all master’s students on the Digital Innovation & Management Programme and specializing in Big Data, were named third in the competition. The students presented their solutions to a committee consisting of Jesper Nielsen, Director of Danske Bank Personal Banking, Eva Berneke, CEO of KMD and Marianne Dahl Steensen, CEO of Microsoft Denmark. The group was also congratulated as having created the most innovative solution to the challenge.